The Model 4083A clock made its debut at the 1933 A Century of Progress Chicago World’s Fair. Designed by Gilbert Rohde and manufactured by the Herman Miller Clock Company, a division of the Herman Miller Furniture Company, this sleek circular clock was one of seven modernist clocks designed by Rohde that were on display in John C. Moore’s Design for Living model home at the fair. When Rohde was invited to design furniture for the fair in 1932, he insisted his furniture be displayed in a modernist building: “It is understood, of course that the house which I would be asked to furnish would be of some sort of architecture that could be called ‘modern’ in the sense that it would not be typically of any historical period, for the furnishings that I design are exclusively of the ‘modern’ character.” Akin to his stylish furniture, the Model 4083A’s circular face is demarcated by twelve plain chrome-plated spheres instead of numerals, reinforcing the clock’s machine-age appearance. Rohde’s Model 4083A appears to be a distant and smaller cousin of Walter Dorwin Teague’s Model #1186 ‘Nocturne’ Radio from 1934­­. Both designs share colored mirrored glass surfaces and handsomely merge industrial materials with geometry. 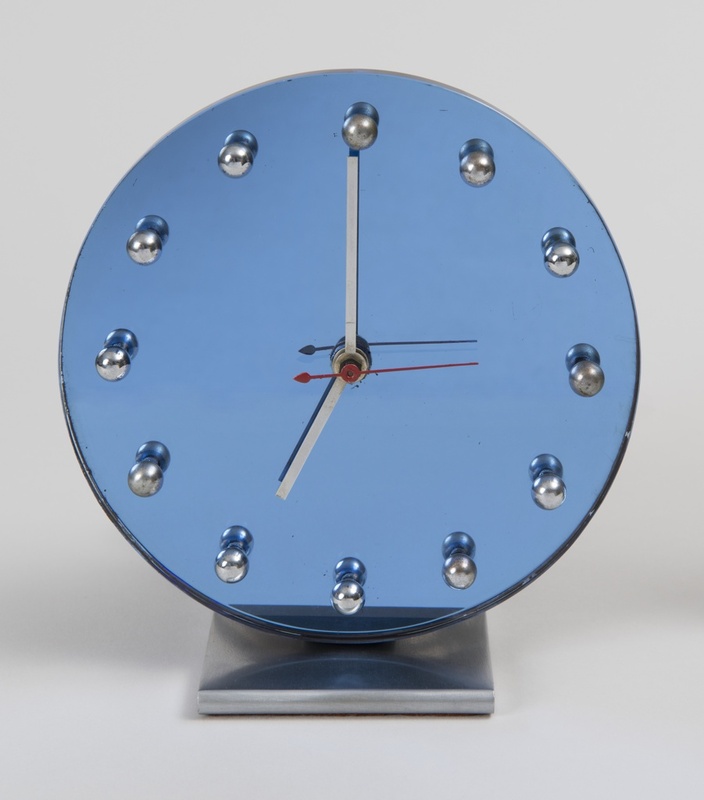 Rohde’s use of colored mirrored glass certainly impacted 1930’s domestic clock design, as can be seen in several mid-1930’s mantle clocks by Telechron (which was taken over by General Electric in the 1940’s). Telechron’s 4F62, marketed as the Blue Nite and their 4F65, known as The Luxor, are the company’s best examples of adapting a similar type of colored mirrored glass. Gilbert Rohde was a champion of modern design in America and created elegant modern furniture for middle-class Americans. In addition to his renowned work for Herman Miller Inc., he also designed for several other furniture firms, including Thonet, Troy Sunshade, and Heywood-Wakefield. His career ended in June of 1944 when he suddenly died of a heart attack while dining with his wife in New York City, but his contribution to American modern design, as can be seen in the Model 4083A, was unforgettable. Ross, Phyllis. Gilbert Rohde: Modern Design for Modern Living. New Haven: Yale University Press, 2009. Print. Rohde died of a heart attack in a French restaurant in New York. You are absolutely right and thank you for bringing it to my attention. This will be updated shortly. I apologize for the delay! I hope Cooper Hewitt will amend this entry to reflect that Gilbert Rohde had a heart attack in a restaurant in New York City. I apologize for not correcting this sooner but I have submitted a revised and corrected version. It should be up this week. I’m very grateful for all of your research on Rohde and your book has been a tremendous resource. Thank you for the correction! When clocks and watches are photographed, the time set to 10:10 is best and standard practice in the timepiece industry. 4083A Clock, 1933. Designed by Gilbert Rohde. Glass, chrome-plated metal, enameled metal. Gift of George R. Kravis II. 2015-5-3.